Djam Karet’s latest (their 17th album) is meant to be something of a celebration of the band’s 30th anniversary together, featuring all the original band members – that means Henry Osborne on bass instead of Aaron Kenyon, who is still a member of the band, just not featured on this one. For anyone familiar with the band’s first cassette release No Commercial Potential from 1985 (since reissued on CD), the seven tracks here underscore how far the band has come in the years since, evolving from purveyors of well-rehearsed jams into masters of superbly refined compositions and equally concise instrumental interplay, and they have stuck to their guns as far as presenting a musical palette sans vocals. For all of its refinement, Regenerator 3017 presents a more laid-back, bluesy and funky sound than what we’ve heard from this band before, the result being a refreshing adjustment in their trajectory. Embracing a more bluesy sound on “Lost Dreams,” the guitars drive strong melodic solos in tandem with keyboard support, often recalling elements of the pre-Dark Side of the Moon era of Pink Floyd or even Robin Trower. “Living in the Future Past” has funky all over it, with walking bass, Rhodes, and Mellotron supporting some positively dreamy jazz guitar leads with powerful Minimoog-driven melodies as well, perhaps the album’s standout tune. The band has made a point of not introducing any studio computer manipulation or compression to the production and mix, thus everything is heard as it is played. Frankly I have no problem with a certain amount of compression, but in this case the band’s choice on the matter seems to suit the overall sound well. Flute patches on “Wind Pillow” along with the soaring lead guitars give the piece a distinct Camel vibe, while riding along on a dreamy groove that is instantly captivating. There’s too much good here to itemize every single highlight in a review, but the more one listens and builds familiarity with these seven cuts, the more this disc reveals its substantive essence. 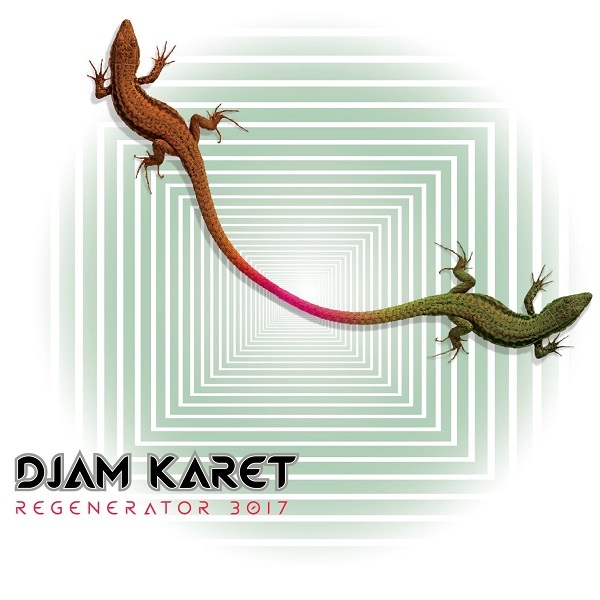 Djam Karet has been around for 30 years and they’ve just released their 17th full length album Regenerator 3017. The core members Gayle Ellett, Mike Henderson, Chuck Oken Jr., and Henry J. Osborne are still playing together. Over the years the band has experimented with different styles and what we have on Regenerator 3017 is very mature and laid back progressive jazz fusion. These are accomplished musicians who are very comfortable playing music with each other. The music is soothing and a joy to experience. There are many different things happening that are intelligently integrated into these seven instrumental tracks. I found the best moments on this disc to be part of “Wind Pillow” with its quiet melodic music and Gayle’s Mellotron. Most of the time they’ve split the guitar solos with Gayle on the left, Mike Murray in the middle, and Mike Henderson on the right. But you would have to listen very carefully to notice this separation. It took Djam Karet about 18 months to perfect the pristine sound quality on this disc without the use of compression or computer manipulation. Clearly Regenerator 3017 is a labor of love.